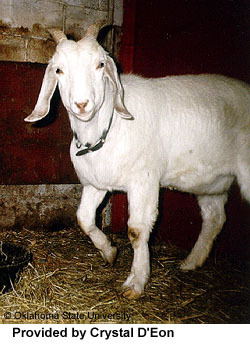 Pasteurizing goat milk kills unnecessary bacteria and extends the refrigerated life of your milk. It is an easy and simple process that any individuals can master. Fill the bottom of your double boiler with a couple inches of water. Pour your fresh goat milk into the inner pan. Pour a few inches of cold water into your sink. Heat the milk until it reaches 161 degrees F and hold it there for 30 seconds. Candy thermometers usually have handy clips on them so you can have it sitting in the milk the whole time. Remove pan from heat and set the pan down inside your waiting sink of cold water to cool your pan and milk. Pour the milk into the clean milk jugs and store in the fridge below 39 degrees F.